Salesforce is promising low-latency data processing for real-time apps, but don’t expect to hear the ‘Thunder’ until Dreamforce 2016. 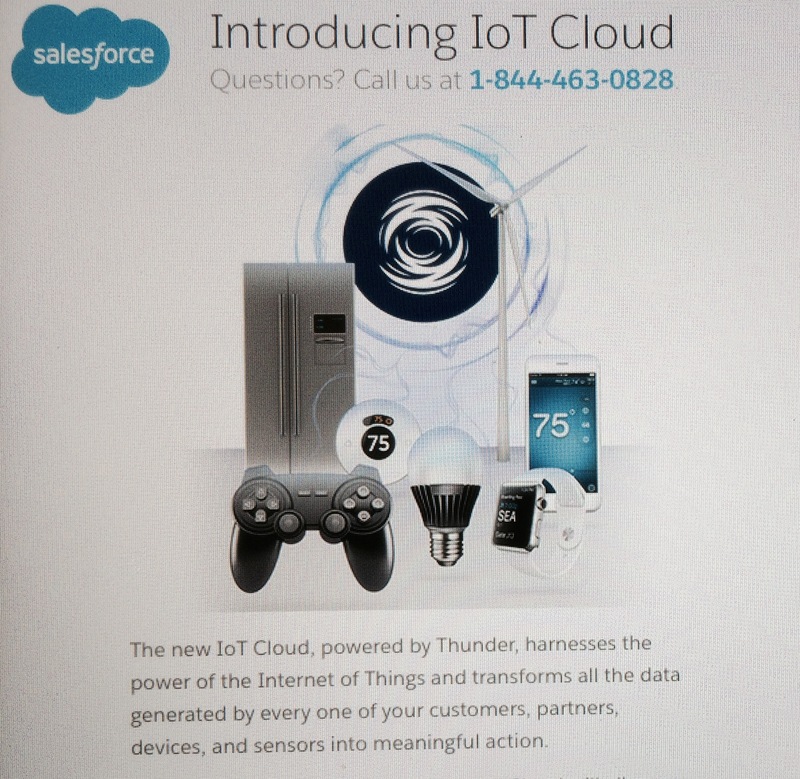 Salesforce announced the IoT Cloud Powered by Salesforce Thunder this week at Dreamforce 2015, but it’s a streaming data capability not likely to become generally available until next year’s Dreamforce. Thunder is needed to capture data from sensors, mobile devices, wearables and other sources that often demand data processing within seconds or subseconds, as in (but not limited to) Internet-of-Things scenarios. Part low-latency data bus and part rules engine, Thunder is being developed with open source technologies including Kafka for data capture and messaging, Storm for streaming data distribution, Spark for in-memory data processing, and Cassandra as a high-scale database. What’s less clear is what Salesforce will contribute to this architecture and which cloud platform it will run on. [NOTE: Salesforce confirmed, post-publication, that Thunder will run on Heroku.] The Force platform and Heroku are both now lumped together as the Salesforce App Cloud, but Heroku still runs on Amazon Web Services. A third option might be Azure, as Microsoft was announced as a partner development customer. News Analysis: Inside Salesforce Thunder from Constellation Research on Vimeo. The toughest challenge is likely to be how real-time IoT data-analysis can be synced with Salesforce apps and a Wave Analytics Cloud that currently supports hourly data updates at best (with daily updates being the norm)? It’s fitting that Thunder is following Salesforce Lighting, last year’s big Dreamforce announcement, as Lighting was revealed nearly a year before it actually became available. According to this week’s press release, Thunder will enter pilot testing “in the first half of 2016 with general availability later in the year.” So it seems Salesforce’s marketing-oriented pre-announce/re-announce approach is getting to be a habit. The bottom line is that Thunder is a roadmap positioning statement rather than a real capability at this point. Many tough problems have yet to be solved, so in Constellation’s view it’s going to be ten months to a year before the vast majority of customers can start to realized IoT dreams and aspirations in the Salesforce IoT Cloud. Next Tata Consultancy Services Analyst Day: What Stands Out?